Last April, veteran anti-war activist Ken Stone travelled to Syria as part of a seven person solidarity mission with the people of Syria, becoming one of the first tourists to visit liberated Palmyra. 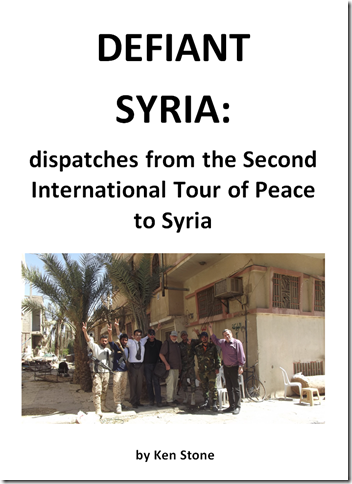 Stone recounts his trip in Defiant Syria: Dispatches from the Second International Tour of Peace to Syria. Defiant Syria is available online as an e-book or in paper by sending an e-mail to the Hamilton Coalition to Stop the War at hcsw@cogeco.ca.